Today I walked to Kingston to meet Geoff Austin (see 22nd. June post) at the Canbury Arms. Jackie had used Google Earth last night to find the route for me. She is very good at taking the walk through locations, and I was amazed at the pin-sharp pictures showing me the roads I needed to walk down, and picking out the landmarks like Wickes at the corner of London and Gordon Roads. Taking the Martin Way route, I crossed Bushy Road into Sidney Road, turning left at the end and on to Raynes Park Station; went under the bridge and along to Coombe Lane from which it is more or less straight through to Kingston; arriving at the pub with an hour to spare. Almost opposite Raynes Park Station still lies, now undergoing refurbishment, the establishment where Bob Mitchell treated the young Jackie and me to fish and chips after cricket matches and drinks in the Raynes Park Tavern. Bob was a free spirit who enlivened matches more by his antics than by his cricketing skills. He was instrumental in my one and only loss of temper on a sportsfield. I once won the club single wicket competition. This is a knock out event where members play short individual matches against each other with their colleagues doing the fielding. In one of the earlier rounds I was up against Charlie Moulder (see 13th. July). Bob decided to even things up a bit. When I had scored just one run, as umpire, he gave me out caught by the wicket keeper. My bat had been nowhere near the ball. I’d like to say that I was a little upset. Unfortunately that would be dishonest. I was in a blinding rage, especially as Bob laughed when I walked past him. Normally I opted to bowl up the hill at Cottenham Park, because that would slow me down and give me more control. This time, I knew I would have to bowl as fast as, or even faster than, I could. So I chose to come down the hill. Still fuming, I scared the life out of a really very nice man, tearing down with my hair, at that time halfway down my back, streaming in the wind. The first ball knocked out two of Charlie’s stumps. Bob was quite unashamed in acknowledging what he had done. Jackie, on the other hand, was very ashamed of me. Mr. Cool had got too hot under the collar and behaved disgracefully. Now I’ve grown up a bit, I too, am ashamed of that performance. Bob was an incorrigible ladies’ man. When, in his nineties, a couple of years ago, he arrived at the club’s 60th. Anniversary Dinner with a very attractive young woman in attendance, the story was that she was his carer. But we all knew better. We knew that our Bob had not lost his touch. 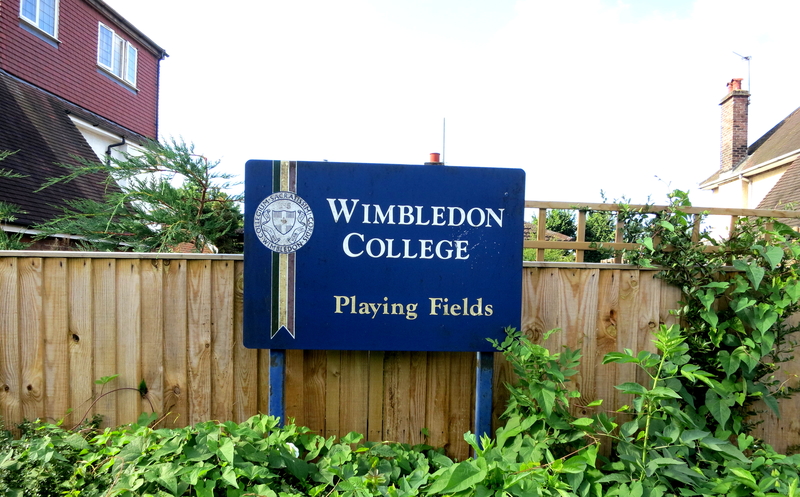 Along Coombe Lane this morning I passed Wimbledon College Playing Fields. We always walked there from the school in Edge Hill to play rugby and cricket. It was here that Tom McGuinness, mentioned on 10th. July, scored what I believe to be his only try. Tom’s eyesight was so bad that he could never see what was going on. One afternoon he found the rugby ball in his hands. ‘What shall I do?’, he asked me. ‘Run for the line’, I replied. ‘Where is it?’ enquired Tom. ‘That way’, I indicated. Tom sped for the line, fell over, and touched down. No-one saw him. The fact that we were playing in dense fog had levelled this particular playing field. I could tell a schoolboy cricketing story or two, but perhaps the one above is enough for Judith’s tolerance in any one post. The grandeur of the houses along Coombe Lane West, and those on the private roads off it, contrasted with the more humble dwellings and shops in Norbiton, where now live a number of people from Korea. 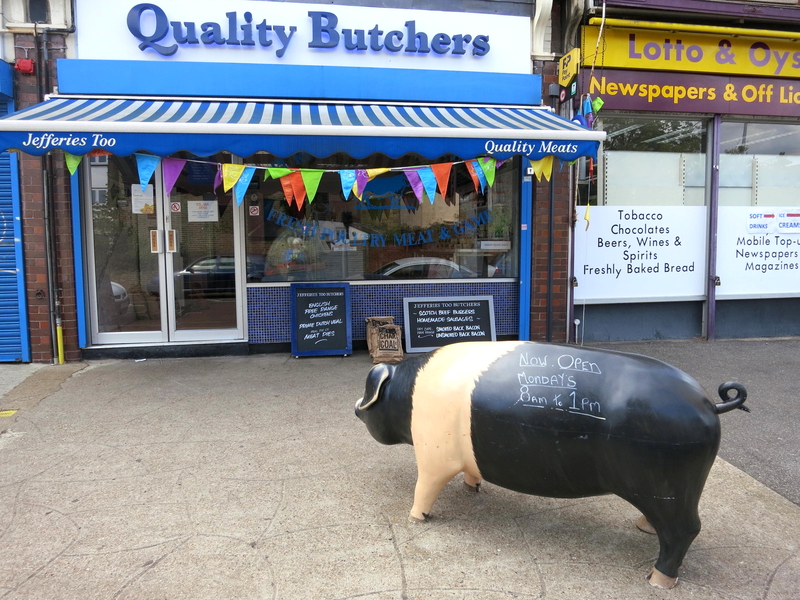 Among those catering for the incomers, there are still traditional shops near Norbiton Station, including a butcher’s with a novel way of announcing its presence. 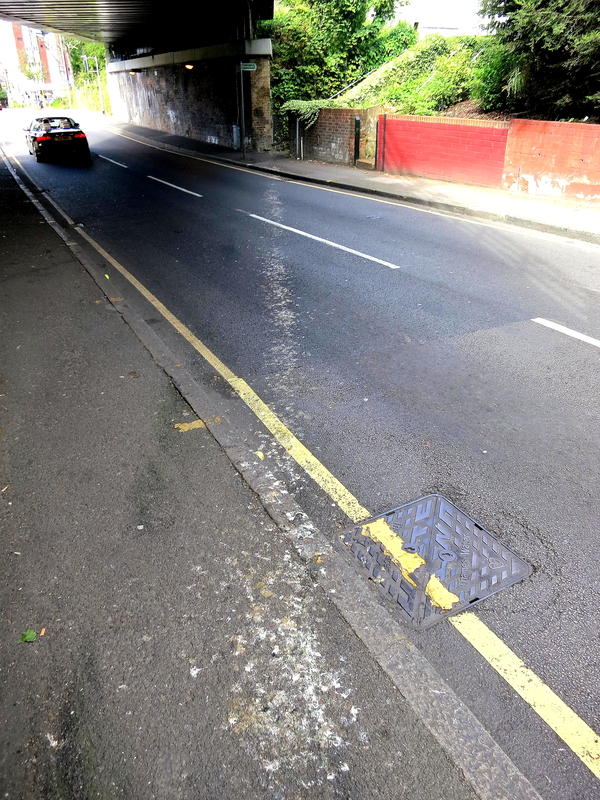 The trails of pigeon droppings crossing the road on either side of the railway bridge caught my eye. I decided they had been made by rows of birds perched on the top of the bridge, rather than one unfortunate with the runs. I thought it best not to look up. Passing Warren Road, one of the private ones mentioned above, I reflected on ‘Shern’ children’s home which was once there. (On 25th. August I post a correction to this. ‘Shern’ was in fact in New Malden. It was the baby nursery in this location.) On the far side of Norbiton are council estates which housed many of the families who were clients of Kingston Children’s Department, as it was in the ’60s, before the Seebohm Report led to the creation of Social Services Departments. Whilst it would not be appropriate for me to publicise any of their stories, I have fond and clear memories of those who were my responsibility in my first employment as an Assistant Child Care Officer. With time out for training, I was there six years. During my first summer every one of the boys resident at ‘Shern’ was on my caseload. They thought it strange that on each visit I would only see one of them. Eventually they grasped that this was my way of emphasising the importance of each individual. 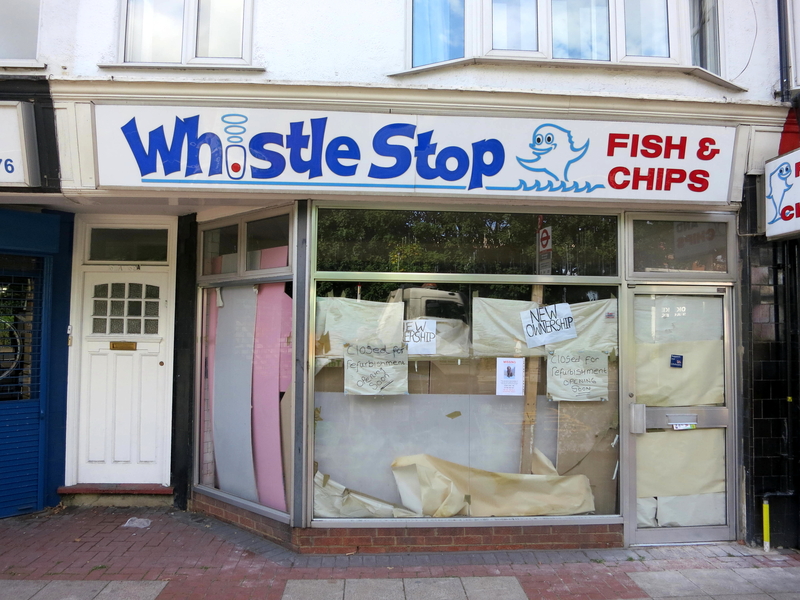 This, of course, meant that I made rather more calls to this establishment than was the norm. Whilst waiting for Geoff I spoke to Louisa on the telephone. 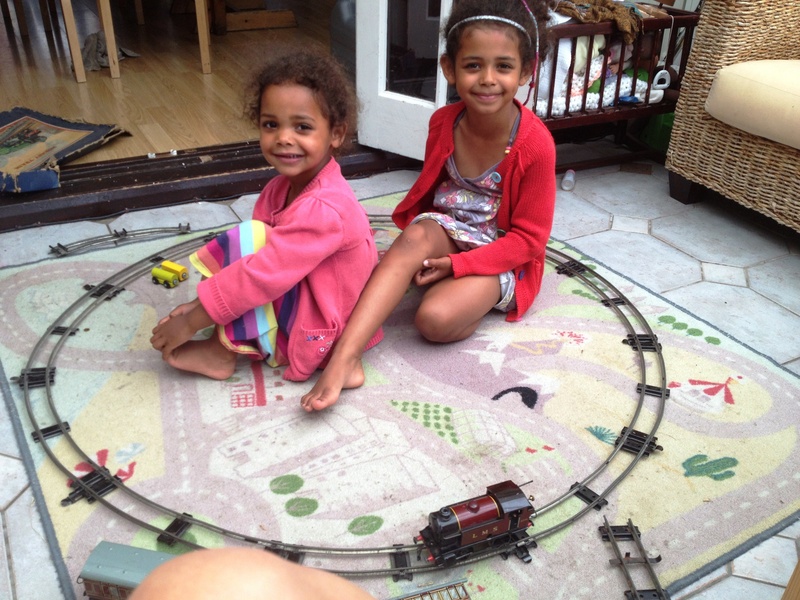 Yesterday she had published on Facebook a photograph of Jessica and Imogen playing with a Hornby Train Set the girls had found in their garage. This antique toy, in full working order, was still in its original box. Winding it up and setting it going was giving hours of pleasure. Suddenly the parents of little boys were asking if they could come and play with my granddaughters. Louisa had asked me if the train set had been mine. Well, I suppose I am antique enough. I knew it was not mine, and that it had been a find of Grannie Jess’s. Yesterday I hadn’t been sure whether this had been in a car boot sale or on a skip. Overnight I had recollected that this treasure had been salvaged from a skip outside a house that was being cleared. Miraculously the Canbury Arms survived. It was therefore able to provide us with lunch of sweetcorn and tarragon soup followed by beef and mushroom pie, chips, and salad. We each made the same excellent choice, and drank a local brew called ‘Naked Ladies’. Neither of us could manage a sweet. The K5 bus which took me back to Morden is a ‘Hail & Ride’ facility running once an hour. This means that, on certain sections of the route, you just hail it like a taxi, or, if on board, ring the bell and it stops for you. It is one of Geoff’s achievements as a Councillor that this threatened service has been retained. This entry was posted in Uncategorized and tagged Bob Mitchell, Canbury Arms, Charlie Moulder, Geoff Austin, Hail and Ride, Hornby train set, Norbiton, pigeons, rugby, Shern children's home, single-wicket competition, Sopwith Camel airplanes, Tom McGuinness, Whistle Stop fish and chips, Wimbledon College by derrickjknight. Bookmark the permalink. Keep up the great work! You realize, lots of persons are hunting round for this info, you can help them greatly.